The story we would like to tell now is a quantitative one. It is about how numbers and people in power helped initiate profound cultural changes that affected an exploited, underserved, and vulnerable group of athletes. It is about thoroughbred horse racing, jockeys, and the lives of athletes after retirement (Speed, 2007). In using metaphors, folktales, and images we need to remind ourselves constantly that we are all bent in different ways. Violence against children in all its forms (physical, psychological, sexual) is a social problem, and, like other sectors of the community, the sport sector cannot prevent serial offenders from gaining entry into the system. In 1994 Andersen received the Dorothy V. Harris Memorial Award for excellence as a young scholar and practitioner in applied sport psychology from the Association for Applied Sport Psychology. He has been a keynote speaker at 10 international and national conferences and has published more than 60 articles in refereed journals and more than 75 book chapters and proceedings. 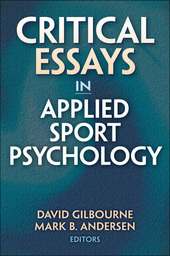 He has edited three other Human Kinetics books: Doing Sport Psychology, Sport Psychology in Practice, and Overtraining Athletes: Personal Journeys in Sport. Andersen is a member of the Australian Psychological Society (APS) and APS College of Sport and Exercise Psychology. In addition to his academic duties, he maintains a small psychotherapy practice in Melbourne.